Be the first to share your favorite memory, photo or story of Aubrey. This memorial page is dedicated for family, friends and future generations to celebrate the life of their loved one. 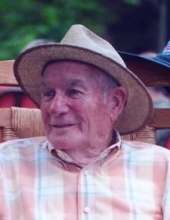 Aubrey "Pete" Davis, age 89, of Lower Johns Creek, passed away Friday November 30, 2018 at the Pikeville Medical Center. Aubrey was born July 28, 1929 the son of the late George Thomas and Bessie Murphy Davis at Brushy, Kentucky. Most people knew him as Pete. Pete was the owner of Williamson Supply, a member of Freedom Bible Church, and an Army Veteran who served in the Korean conflict at Panama Canal. along with his parents, Pete was preceded in death by his wife, Betty Maynard Davis, a grandson, Heath Peyton Thompson, a brother, Lowell Davis, and three sisters, Mildred Declercq, Doris Davis, and Judy Spradlin. Pete"s survivors include: His two daughters, Patsy and her husband Nelson Scott, Betsy and her husband Tommy Thompson,all of Lower Johns Creek, five grandchildren, Ryan Davis Thompson, Andrew Cory Thompson, Hannah Watercutter, Nathan Chase Scott, and William Aaron Scott, and one great grandchild, Henry Heath Watercutter, two brothers, Charles Davis of Sterling Heights, Michigan, and Bill Davis of Meta, Kentucky, and one sister, Edwina Boyd of Pikeville, Kentucky. Visitation will be at J. W. Call & Son Funeral Home Sunday December 2, 2018 from 5:00 untill 9:00 P.M.
Pallbearers will be: Andrew Cory Thompson, Nathaniel Chase Scott, William Aaron Scott, Nelson Scott, and Randy Watercutter. To send flowers or a remembrance gift to the family of Aubrey "Pete" Davis, please visit our Tribute Store. "Email Address" would like to share the life celebration of Aubrey "Pete" Davis. Click on the "link" to go to share a favorite memory or leave a condolence message for the family.